Those were my exact words to my doctor two weeks ago. Picture me, pale, shivering, weak, sweating and clammy, but had the energy to laugh at my doctor. And now I’m gladly eating my words. I’ll make this long gross story very short. About 10 months ago, my normally VERY predictable and peaceful digestive system started changing. At first, it was some morning misery and then I was fine the rest of the day. Then it was getting up and rushing to CrossFit so I could get there in plenty of time to enjoy some more morning misery and then do the workout, which sounds strange. Once I was done with losing everything I had eaten….through the lower option, I felt okay enough to workout. Then it turned into 2 or 3 times a day and running was a maniacal scheduling of bathroom stops. At first, I thought maybe it was stress induced IBS since stress causes everything that can’t be explained, right? Surely my stomach would calm down when summer arrived. Nope. Things gradually got worse until I got to about 7 or 8 days of staying at home or working at school but not going anywhere that didn’t have a bathroom. The last 3 days before I went to the doctor, I couldn’t leave the house. After a long discussion with the doctor who asked so many questions, he was convinced my problem was gluten. I laughed. I really did. I have NEVER had a problem with bread and pasta. The image below adequately depicts my facial expression. He looked at my food journal, which I will ALWAYS have a hard copy for this very reason. The first words out of my mouth were “but I don’t eat a lot of bread or pasta!”. He looked at the recent two weeks. Being diabetic, I had already cut my flour carbs back to 2-3 servings maximum and everything was now WHOLE WHEAT since that is what they recommend for slower absorption of sugar. However, guess what I eat when I’m sick and having tummy trouble? Chicken noodle soup. Macaroni with butter. Crackers. Stuff that is “easy on the stomach”. Nothing but gluten. 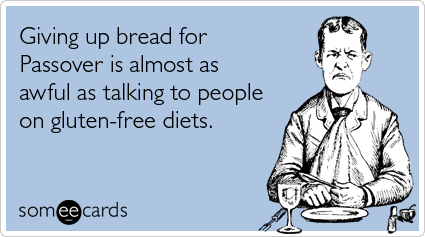 And prior to those really heavy carb/sickness weeks, I eat bread/pasta/flour at least once a day. And that sent my system into explosive freak out mode. He told me to immediately start eating bananas, rice and potatoes to stop the main issue of food literally going right through me. He took a vampire’s nirvana of blood to test for other possibilities and specific tests for signs that something dietary was causing the problem. Because this had been going on for so long, he was almost positive that I didn’t have a virus. And he said to educate myself on a gluten free diet and until I felt better, stick to whole food, protein, and keep starches to rice and potatoes. I told him that I thought it was ridiculous. He said to give it 4 weeks. I took the banana he offered and went home to sleep the day away and try NOT to stress over this possibility? Three days after the bland diet, I felt better because I was actually keeping food where it belonged. Then I started adding in fruit and veggies, minimal animal protein, and kept up the potatoes. My blood sugar lowered, which surprised me. A week later, I was feeling a TON better. I got the results from the blood tests and I didn’t have any infection but I was not absorbing vitamins, and certain antibodies were present, both of which are a positive sign of celiac disease. We opted NOT to go through the hoops for the invasive procedure to confirm celiac. He didn’t want me to wait that long and there was a high enough antibody level for him to confirm I do not need gluten in my life. A week after going gluten free, I did something really stupid. I ate a fast food grilled chicken sandwich. It was a long training day at school and Stephen and I met at a local fast food place so we could eat before he went to night shift at work. We were talking and trying to eat quick and I didn’t think one minute about the bread. I ate it and we parted ways and it never crossed my mind….until about 2 am. My symptoms returned with a vengeance. Worse than I ever had. Not just the horrible digestion problem, but swelling joints, migraine, and itchy patches on my skin. I spent the whole day in misery. I would not have been able to work that day if school was in session (thank goodness it wasn’t). So I finally had a definitive answer. Gluten was slowly destroying my intestines. But how does this happen? How can I be fine one day and a few weeks later, have problems and a few months later, be so miserably sick? There are several theories. There is a strong genetic trend. I found out tonight that my great-grandmother could not eat wheat. I had no idea. My mother and grandmother seem to tolerate wheat just fine and so did I until a few months ago. Another theory is the wheat of today is nothing like the wheat of 5, 10, 15 years ago. Don’t get me started on Monsanto. Our wheat today is franken-food. Many people’s bodies tolerate it just fine. Unfortunately I am not one of them. In the past 3 weeks, I’ve had 2 heavy contaminations of gluten. I went to a Mexican restaurant and got tortilla chips with beans and chicken. I found out the next morning that I had come on contact with flour. I did a little digging for eating out while gluten-free and many restaurants thin their beans with milk and regular flour, not corn flour. While I didn’t have the hours long misery from the bread contamination, I had very definite signs that I had something with gluten. I’m still a little shocked by all this. However, the results are astonishing. Aside from the fact that I have a life now, my energy soared. I used to doze off while driving home. At red-lights. I would come home after school and crash on the couch for 2 hours. I mean crash hard. I wasn’t sleeping well. Just the change in energy level is hard for me to reconcile with a wheat/gluten issue. But it certainly isn’t a placebo effect. I don’t WANT to cut out gluten. Believe me, I’m not a fan of Paleo diets even if I’m a religious CrossFitter. I looked over that plan and immediately crossed it off my list because we need carbs, people! But now I have to look to other sources. My weight has steadily dropped. I’m down 13 lbs in 6 weeks. Some of that weight drastically dropped during the vicious 2 weeks before going gluten-free. The rest has been dropping steadily at 2-3 lbs a week. I am more sensitive to sugar and salt bloat so that is weird to see. One day, my stomach is completely flat. The next I could pass for an early pregnant girl. In those cases, sugar or heavy salt from restaurant meals are easily pinpointed as the source. So now what? I’m not doing a lot of substitutions for wheat flour. I still vividly have the hours of gluten hell to look back on. I don’t want to shake things up too much. I’m eating a lot of salads when we eat out. I’m eating fruits, veggies, and meat at home. Some dairy like yogurt and cheese. And I’ll be taking meals with lentils and quinoa because I already had those in my diet. For now, I’m sticking to what works and enjoying the benefits. I’m glad that cutting out gluten is working for you. I honestly don’t know if gluten is my problem or not. It’s just something that I’ve been dealing with for a while, the stomach aches.